If you’re looking for a wardrobe staple that will easily transcend seasons, invest in a button-down shirt. A simple, well-fitting blouse in an array of colours can inject some much needed life into your look. You’ll always have something to wear, when there’s a clean, colourful shirt in your collection. EziBuy offer a wide range of shirts in a large variety of shades. The Emerge Sleeveless Shirt (above right) is one of our favourites. Available in 9 different, on-trend colours and best of all comes with a free cami to wear underneath. It’s light weight, making it perfect for those hot summer days. 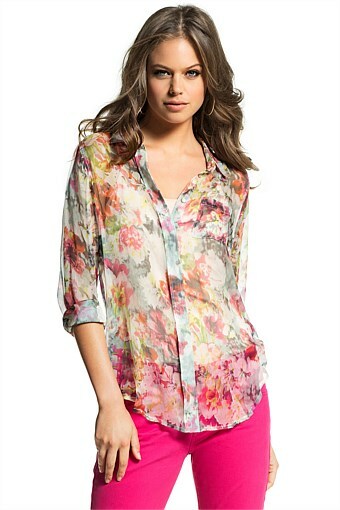 Floral fans will love the Emerge Printed Silk Blouse (above left), featuring a bright garden floral on 100% silk. If you’re looking for a long-sleeved alternative Emerge also has the Must-Have Pocket Blouse (above) in 27 shades! With a mix of florals, darker hues, pastels and neutrals, it’s easy to find at least a few that you can’t live without. Pair either style of shirt with a pair of jeans in classic denim or, if you’re daring, in a bright colour. Lucky for you EziBuy has the perfect style and shade for all. Pair with a pencil skirt and a pair of heels for a sophisticated look which will take you from day to night. Combine with Capri pants for a perfect weekend shopping outfit or lunch with the girls. Wear over your swimsuit as you relax by the pool on those enviable summer days. Follow our advice and don’t waste anymore time standing in front of a wardrobe full of clothes with “nothing to wear”.